Perennial climber with dark green, evergreen leaves and shoots attached to support by aerial rootlets. The small, greenish flowers are followed by black berries. Flowers Yellowish-green petals which are 3-5 mm long. Flowers Mar-May. Fruit Deep bluish-purple to black when ripe, 5-8 mm in diameter, two or three seeded. Leaves Dark green or variegated ivory-white, 3-15 cm long, with very variable shapes. 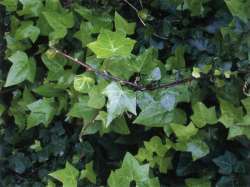 Stems Up to 30 m long, creeping climber, becoming stouter and more erect at flowering. Attached to support by means of aerial rootlets. Waste places, river-beds, stream banks, cliffs, often climbing over trees and fences. Scattered throughout NI. In Nelson, Canterbury, Marlborough and Otago Peninsula in SI. Also Halfmoon Bay, Stewart Island. Originally from temperate Europe and Asia. 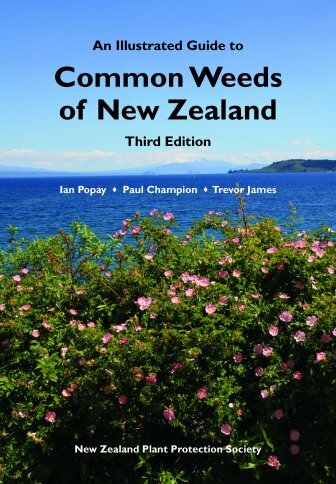 Both berries and foliage can be poisonous, but no poisoning of livestock or children has been recorded in NZ. Sometimes planted as a ground-cover plant. Subject to a Pest Plant Management Strategy in one or more regions. Check with the regional council for details.